The mission of the Pacific Association of Collegiate Registrars and Admissions Officers (PACRAO) is to provide its members opportunities to learn, engage, collaborate, inform, gather, contribute, and promote the best practices and general advancement of higher education and our professions. The Pacific Association of Collegiate Registrars and Admissions Officers (PACRAO) is a non-profit association representing more than 350 regionally accredited 2-year, 4-year, and graduate schools with an individual membership of 1,500 professional admissions officers and registrars. The Association provides conferences and other professional development opportunities for the consideration of professional issues common to its members. PACRAO also provides an avenue for members to contribute to the general advancement of higher education, their professions, and their individual careers. The states of Alaska, Arizona, California, Hawaii, Idaho, Montana, Nevada, Oregon, Utah, and Washington; the Territory of Guam; and the provinces of Alberta, British Columbia, Manitoba, and Saskatchewan, Canada. Associated with a national organization, American Association of Collegiate Registrars and Admissions Officers (AACRAO), which holds its annual meeting each in April. As an outgrowth of the national association, which was formed in 1910, a Pacific section of 18 delegates first met in May 1923 at Stanford University. The second conference was held at Berkeley in 1926. Since then meetings have been held annually except in 1929 and 1943. Proceedings, compiled after the annual meetings, document the history of the Association. 1993 PACRAO was the first regional organization to create a Diversity Development Committee. Held in early November at a location and date chosen by the Executive Board. The conference site normally rotates from central to north to central to south. 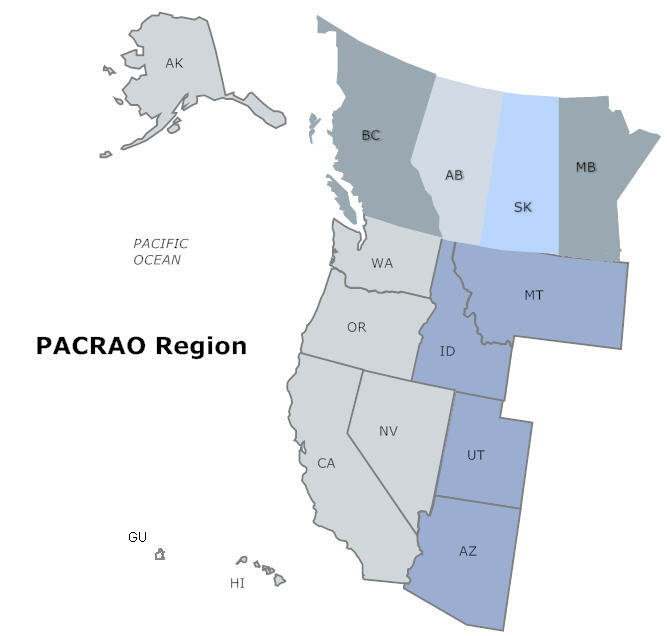 PACRAO sponsors periodic training and professional development opportunities throughout the region, reaching out in particular to members unable to attend the annual meeting. Professional development programs offer relevant training and emphasize practical strategies and creative approaches to issues in admissions and records.